To assist in relocating earthquake-displaced Haitians back to their home communities, the Salvation Army World Service Office (SAWSO) has completed the construction of 600 housing shelters its Transitional Shelter Program in Jacmel, Haiti. Haitian officials and residents worked with SAWSO to plan and manage the transitional housing shelters project which has allowed for a quick design and building process., said project coordinator, Lyle Laverty. 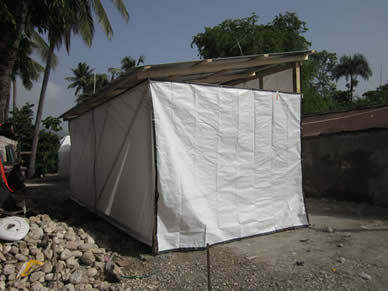 Haitian workers were trained by a transitional housing team. Others have been hired to clear land for the construction of the homes. In all, more than 400 Haitians, comprising at least 45 construction teams, were trained to supervise and build 600 homes. With hurricane season here, more shelters are planned. 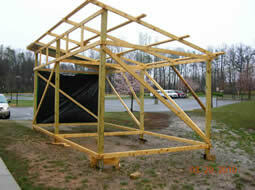 The shelters, standing 10 by 20 feet, are designed to last one to three- years. Overall, approximately 3,000 individuals will be receiving a new home – at an average of five per household. Following the construction of the 600 shelters in Jacmel, which began on June 5, SAWSO will work with government officials in Haiti to plan the second phase of development for an additional 500 homes in Jacmel and another 1,000-1,500 homes in Petit-Goâve. Each home takes one day to complete, with each costing approximately $1,800.